Home to world class gardens, walking tracks and holiday retreats, The Blue Mountains World Heritage Area stretches across an incredible 11,400km of national park and mountainous regions that defines one of the most beautiful scenescapes on the continent. Located a little over an hour’s drive from Sydney, this area is easily accessible and the various valleys that meet in its heart, from the Hunter to Mudgee, Goulbourn and Hawkesbury ensure a diverse range of walks and other activities to partake in during your stay. 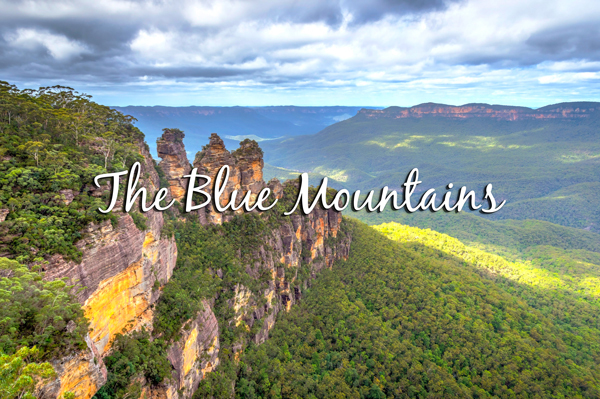 The blue mountains can be seen over a two day itinerary with a campervan rental and are an ideal addition to any east coast tour. A range of national park and camping locations ensures you will have no trouble finding an amazing view to wake up to. Your first stopping point along the way should be Wentworth Falls, a magnificent waterfall and lookout point that is a great opening view to the Blue Mountains region and a fantastic precursor to the sights to come. There are several walking tracks here you can explore which lead into the Blue Mountains National Park with views of the surrounding Jamison Valley. Enjoy the serenity and peaceful vibe of the falls before heading onward to Katoomba. Katoomba is a small town that borders natural marvels such as the ‘Three Sisters’ and the Scenic World’s Railway and plays host to a bunch of local artisan stores that trade arts and crafts as well as fantastic restaurants, art galleries and old colonial buildings which cast the mind back centuries to the days of early settlement. Stop off for lunch at one of the various boutique restaurants in town before heading over to echo point to check out the surrounding views. If classic art is something that appeals to you, the John Wilson Art Gallery has one of the country’s best displays of landscape oil paintings and is well worth a visit between Thursday & Sunday (it’s regular operating hours). Just a little further down the road lies the township of Blackheath, a smaller haven for more arts and crafts stores and boutique eateries with views to Govett’s Leap Lookout and the Fairfax Heritage Track. The track is an incredible experience to walk regardless of skill level and a great way to take in more of the surrounding nature. Spend the afternoon here before heading over to the leafy town of Luera to spend the night. After a hearty breakfast at one of the cozy local cafes, head out of Luera towards Hartley Vale on the road south back towards Sydney. This area has over 18 different walking tracks to discover with many being converted from old trade roads used to lead caravans through the mountains in the 19th century. This area is worth exploring for as long as you like, with plenty of opportunity for photographs and making great memories abound. Mt Tomah is your next stop and will take you right into the heartland of the Blue Mountains. Visit the Mt Tomah Botanic Gardens, which is home to thousands of unique cool-weather plants and situated on top of a basalt mountain peak, commanding an exemplary view of the surrounding valleys and makes for a surreal dining experience if you choose to eat at the restaurant there. Kurrajong is your last stop before continuing along your east coast journey and is a delightful spot to take in your last views of the beautiful scenery before moving on to your next destination. Taste some of the famous apples along with the great local coffee and numerous sweet stores along the main street before packing your bags and heading off.